If it looks cold in this picture, well, it was. The Wilds, a 10,000-acre former strip mine in Muskingum County, Ohio is wide open and windy. Braving the cold is worth it, as the birds are always interesting in any season, even winter. 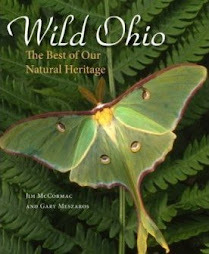 I'm not sure if there is still space available, but you might check the Ohio Ornithological Society's website if you'd like to participate in a cool - literally - field trip to the Wilds in the company of many other cold-hardy souls. On January 15th, we'll have our annual foray there to seem raptors and other wintering birds. Just CLICK HERE for details. I was at the Wilds last Sunday, where I made this interesting mouse observation. But I wasn't there for mice, although many of the birds that I sought were. It was the annual Chandlersville Christmas Bird Count, organized by Scott Albaugh, and I had the great fortune of being assigned to the innards of the Wilds. Jenise Bauman, their director of conservation science training, was my partner, and thus we had access to some areas not always open to visitors. We encountered a few platoons of Wild Turkeys, including the rather fearless group above. There are a number of lakes in and around the Wilds, all of them created during mining operations. Some of them are fed in part by springs, and the constant upwelling of water maintains open pockets even in the most frigid of winter weather. This opening was packed with waterfowl: mostly Canada Geese, Ring-necked Ducks, and Mallards, but also a few Gadwall, Northern Shoveler, Green-winged Teal, Lesser Scaup, Ruddy Duck and even an American Coot. The fowl had an unwanted visitor. This Bald Eagle made frequent recon passes, its massive silhouette creating waves of nervous jitters amongst the lesser birds below. One thing a visitor is sure to notice at the Wilds are mammals - mostly, this species. White-tailed Deer are EVERYWHERE. Sometimes herds roam openly like cattle, other times one notices them peering like wraiths from the vegetation. The Wilds' specialty IS large mammals; but not White-tailed Deer. Birding this place is rather surreal, as distant shapes morph into creatures that probably are not within your search image of typical Ohio animals. Even birders patrolling the perimeter of the Wilds are certain to spot some strange critters roaming within the fences. The Wilds is a large animal research and conservation facility; among the best of its kind anywhere in the world. During the warmer months, tours are offered that'll get you up close and personal with the inhabitants, and I'd highly recommend it. Przewalski's Wild Horse, or for ease of saying, "P-Horse". It's pronounced something like Shih-val-ski. However you say it, they are neat-looking beasts. This animal's native range is the steppes of China and Mongolia, and they have become critically imperiled there. The horses that we know so well today are ancestors of wild horses such as Przewalski's, but this species has never been successfully domesticated. P-Horses, along with many of the other 25 or so species maintained by the Wilds, hail from cold climates and are extremely tolerant of frigid weather. In fact, some of them probably thoroughly enjoy the cold. Here's a native: American Bison. There's a nice-sized herd that roams the grounds, and you are almost certain to see them. A personal favorite: the Onager. Onagers are asses, native to extensive areas of Asia and Eurasia. Or at least they were. Half of the six subspecies of Onager are endangered or extinct, and the overall population has declined dramatically. They're basically big donkeys; a large one can tip the scales at nearly 650 pounds. Up close and personal with an Onager. I shot this from the car. Onagers reportedly are ill-tempered and best left alone. Besides, this guy looked like it wanted to rumble. Possibly the most surreal visual of all is stumbling across a pod of Bactrian Camels in the Ohio snow. Yet there they are, happily gamboling around the Muskingum County landscape. Unfazed by cold and snow, these camels have surprised more than one unsuspecting birder. They, like the P-Horse, are indigenous to the cold and windy steppes of China and Mongolia. Perhaps 800 of them remain in the wild, and they are considered critically endangered. Bactrian Camels are instantly recognizable to most people, because there are nearly 1.5 million domesticated camels and their images are commonly seen. But, it's vital to protect the wild ones, too. There is one other species of camel, the Dromedary Camel, which has but one hump. Jenise says that the camels are quite the hams, and vie amongst themselves for maximum exposure whenever a camera is produced. That seemed to be the case. A ton of camel, right at ya! Dane Adams recently sent along a few of his typically stunning photographs, these of raptors that he found at Big Island Wildlife Area. 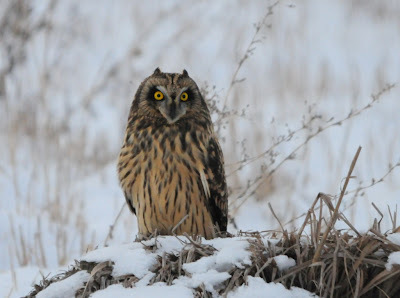 And equally stunning is the Short-eared Owl photo, taken by Russ Reynolds and also at Big Island. All of them are arch-enemies of the mouse in the previous post. 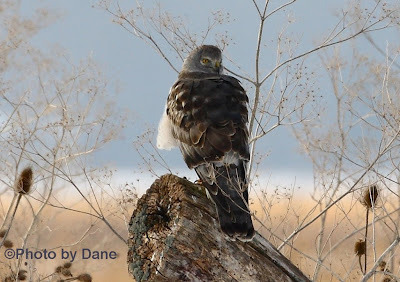 Northern Harrier, Circus cyanea, male. Harriers can look quite owl-like when seen perched, as in this photo. They have exceptional hearing, and use this sense to track prey, probably to a much greater degree than most other hawks. In flight, harriers are a snap to identify. They typically hunt low over meadows, rocking and tilting in a manner suggestive of a Turkey Vulture. Long pointed wings and a conspicuous white rump clinch the ID. Short-eared Owl, Asio flammeus, photo by Russell Reynolds. These odd owls hunt open meadows, and often engage in comical conflicts with Northern Harriers, which hunt in the same places. Their ears are truly short, and rare is the opportunity to observe them. 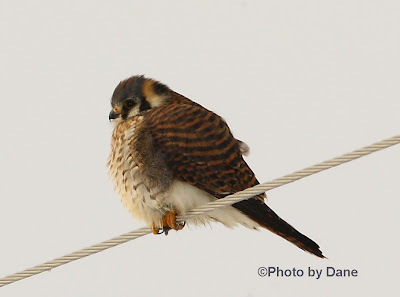 A beautiful female American Kestrel, Falco sparverius, in typical wire-sitting pose. This is our smallest falcon, and a raptor that has suffered significant population declines in parts of its range. The reasons for such losses are varied, and include habitat loss, large-scale conversion of lands to exceptionally "clean" agriculture that greatly reduces kestrel food, pesticide use that triggers downturns in insect prey populations (kestrels eat lots of grasshoppers in summer) and increased competition for nesting cavities. A more insidious impact, at least in some areas, may be the spike in Cooper's Hawk populations; these aggressive accipiters are reported to take kestrels. 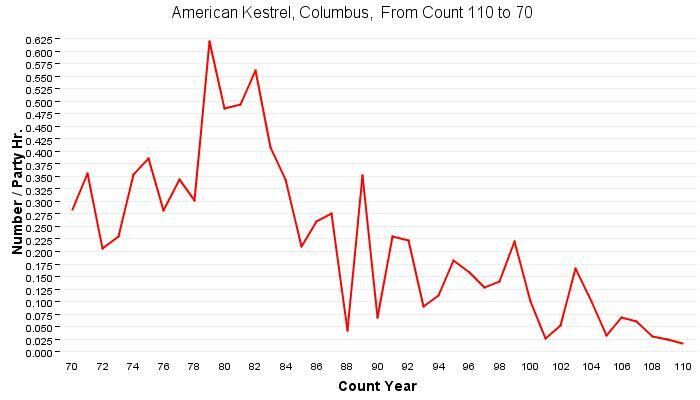 In the very long term, kestrels in Ohio are probably a "boom and bust" species. Prior to European settlement, most of the state was densely forested and generally not good habitat for a raptor that frequents open places. As settlers cleared the land of trees, much suitable habitat was created and kestrels moved in and prospered. Now, the hand of man is tilting the odds against kestrels. Forty years of American Kestrel data from the Columbus, Ohio, Christmas Bird Count. Not an encouraging trend, and it isn't hard to find similar cases of decline. 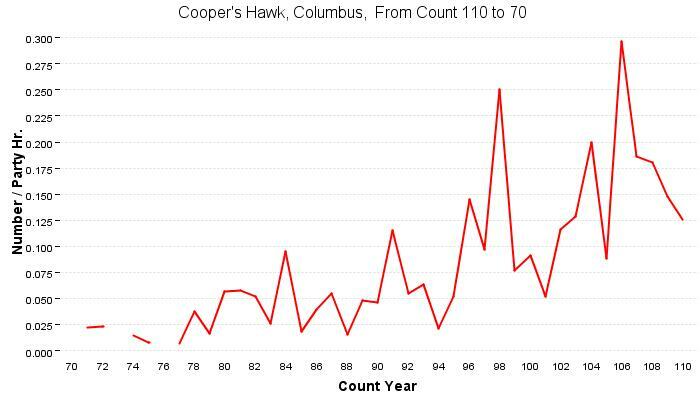 Cooper's Hawk data, also from the Columbus CBC and for the same years. Again, not an uncommon trend in many areas. 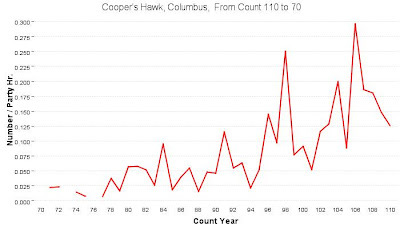 While hawk predation may play a role in the decline of Columbus kestrels, I would say - based on over 30 years of participating in this count - that habitat loss is factor #1. If you would like to learn more about kestrels and their status, check out this research from Hawk Watch International. 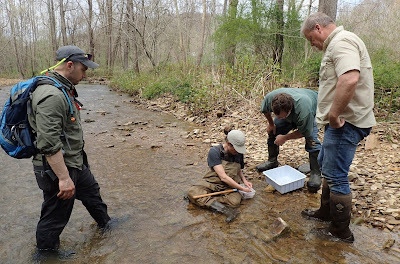 When I was at the Wilds last Sunday, participating in the Chandlersville Christmas Bird Count, I had the good fortune of being paired with Jenise Bauman, their new Director of Conservation Science Training. She is a new birder, and got to see - and hear - some new members of the feathered pack. I got access to the Wilds' 10,000-acre innards, and I'll post some more on that later. Over the past year, the Wilds has constructed a wonderful new conservation science training center, with seating for several dozen. This facility will be outstanding for classroom components of natural history workshops, and I hope to be involved in some interesting activities there in the future. Associated with the center are two brand spanking new cabins, perched on the shore of a small lake. Jenise offered me a nickel tour of the cabins, as no one was in residence, or so we thought. One of the science training center cabins, so new you could still smell the freshly hewn pine from afar. To ensure that the pipes don't freeze in the Arcticlike weather we've been having, there are two small space heaters chugging away inside. In we went for a look around. It wasn't long before we discovered that the cabin did indeed have a tenant! 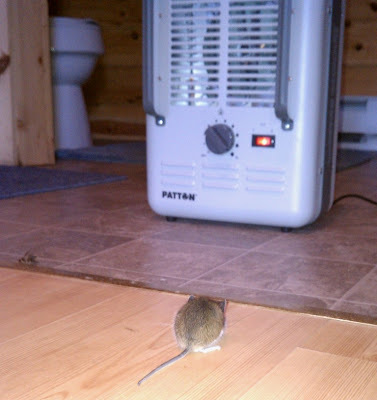 A White-footed Mouse, Peromyscus leucopus, was perched on his haunches about a foot in front of the heater, luxuriating in the warm flow of air. We spotted the mouse from across the room, and I figured that it would flee as soon as it became aware of the bipedal behemoths. 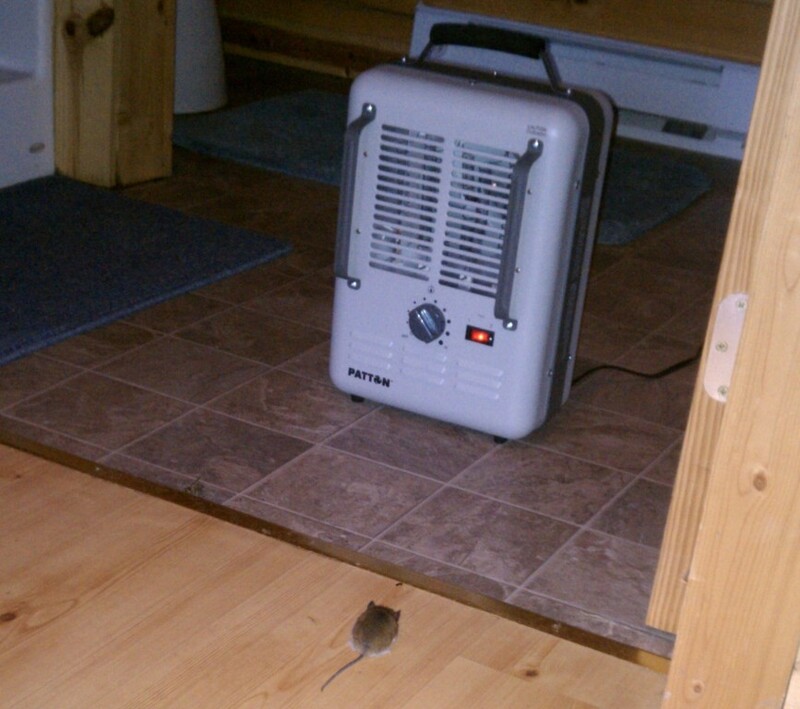 Not to be; apparently so entranced by the balmy air the mouse barely gave me a glance and a twitch of its ears. Unfortunately, my good Nikon was some distance off in the car and all I had was the Droid with which to capture the scene. I crept up to within a few feet to photo-document the clever beast. When we returned some time later - Nikon in tow - Mr. Mouse had apparently thawed sufficiently and departed. The Wilds, Muskingum County, Ohio - today. Windy as could be, temps in the low 20's, wind chills probably around zero, and often heavy snow flurries. I was there to participate in the Chandlersville Christmas Bird Count, orchestrated by Scott Albaugh. We saw some interesting things and more on that later. Adams Lake Prairie, Adams County, Ohio, last June. You won't freeze to death in this place, at that season. And it's packed with botanical goodies, and some interesting animals as well. Downy Wood Mint, Blephilia ciliata, was in its full glory on that trip of last June, and all of us had to stop and admire it. This isn't a rarity, but who cares - Downy Wood Mint is a great looking plant, and you'll be admiring it in early summer, one of the best times of the year. We've got another species of Blephilia in Ohio: B. hirsuta, the Hairy Wood Mint. It too is a looker, but not as good a looker as the Downy, thinks I. The Hairy has whitish flowers, and it just doesn't POP from the surrounding foliage in the way that this one does. There are some roadside shortgrass prairies in Adams County that are so densely populated with this mint that one's eye is caught by them, even at 70 mph. Click the pic to enlarge, and note the interesting shape of the flowers. Many mint species have very ornate, almost orchidlike blossoms. The darker purple spots are nectar guides; colorful sign posts calling out to would-be pollinators to stop by. The genus name Blephilia comes from the Greek blepharis, which means eyelash, and refers to the delicate fringe of hairs that adorn the bracts and calyx below the flowers. Here we can see the leaves, which provide one of the characters that separate this species from the similar Hairy Wood Mint. They are sessile, or lack a petiole (a distinct stem that holds the leaf out from the main stem). The Hairy has pronounced petioles. The mint family is a large one, with some 7,000 species worldwide. Interestingly, the largest genus is Salvia, with about 900 species and some of those - non-natives - are commonly cultivated here. But Ohio has only one native Salvia, and it's rather local in distribution. Mints are a wildly diverse group, and scads of them occur in tropical regions where the learning curve is steep. Here in Ohio, we've only got 47 native species to learn, plus a bunch of non-nativess that leapt over the garden fence and now grow free and wild. 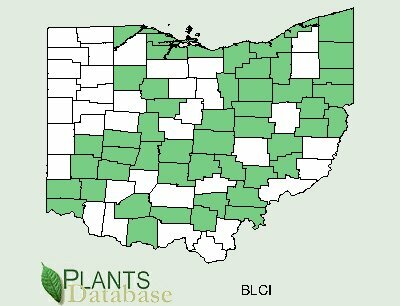 The distribution by county of Downy Wood Mint in Ohio, courtesy the USDA Plant Database. Watch for this one next summer, which right now seems quite a ways off. 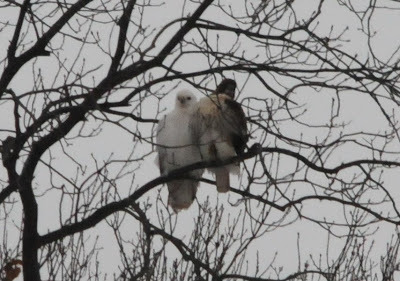 Russ Reynolds, of Lima in western Ohio, found this stunning leucistic Red-tailed Hawk hanging out near home, and was good enough to send along a series of photos. As we can see, its strikingly different appearance hasn't led to a total shunning by the rest of the red-tail community. Red-tailed Hawk male and females look essentially the same, other than in the size department: females can be visibly larger. However, I can't tell who is bigger than who in this shot. 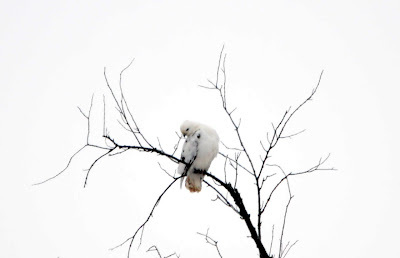 You can view another strikingly leucistic bird RIGHT HERE, and I discuss leucism a bit more in that post. Leucism is a rare genetic condition that causes animals to be, essentially, bleached out. Beasts that are leucistic are often mislabeled as albinos, or in the case of raptors such as Russ's Red-tail in this blog, misidentified as white birds such as Snowy Owls. Leucism is a genetic numbers game - the more frequent the animal, the more likely it'll show up in the population. And the more conspicuous the species, the more likely that one of us will notice it. That's why leucistic Red-tailed Hawks and American Robins are among the top leucistic species that are reported. Animals such as Russ's Red-tailed Hawk are often referred to as "piebald", and show patchy coloration. Sometimes, plumage or fur as the case may be, can appear stark white while other areas may be black. On this bird, some of the normal rufous tones of the tail feathers can be seen in this shot. 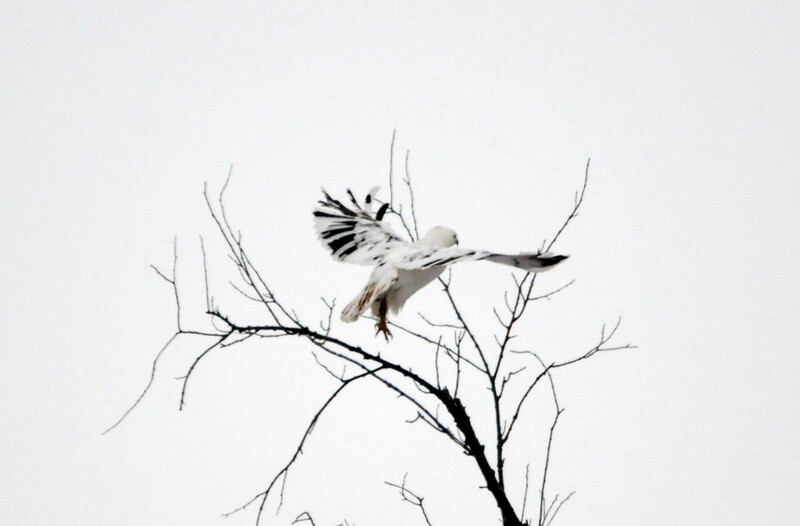 Leucistic birds -and mammals such as White-tailed Deer - can live a long time, and bcome local celebrities. 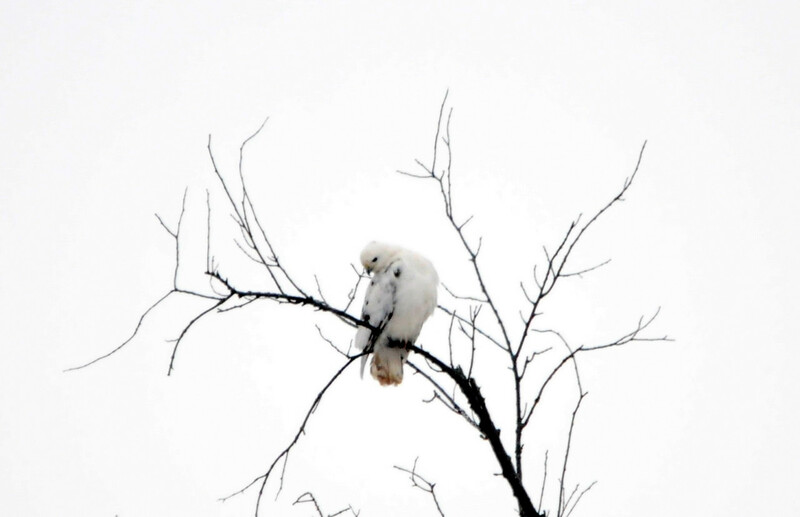 There was a strongly leucistic Turkey Vulture that returned to the Egypt Valley Wildlife Area and vicinity in eastern Ohio for many years, up into the early 1990's. Here's hoping that Russ's bird lives long and prospers. Thanks to Russ for sharing his find and photos! Another Ohio rarity surfaced yesterday, and this one is far more chaseable than the Bohemian Waxwing of my last post. 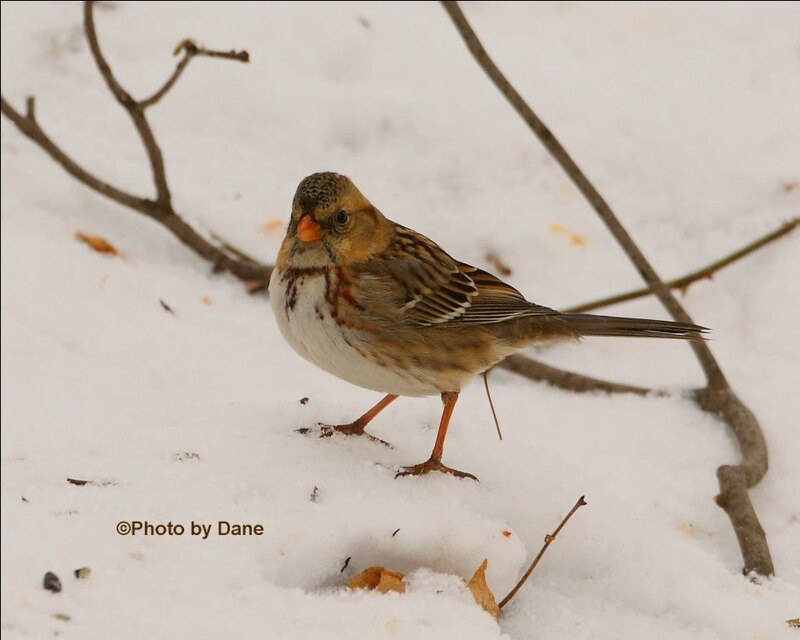 Bruce Glick reported an obliging Harris's Sparrow yesterday, and like most of these western strays, this one was visiting a feeding operation. The homeowner, Robert Troyer, is more than willing to share his find with birders. The address is 9041 Bear Hollow Road, Apple Creek, Ohio. 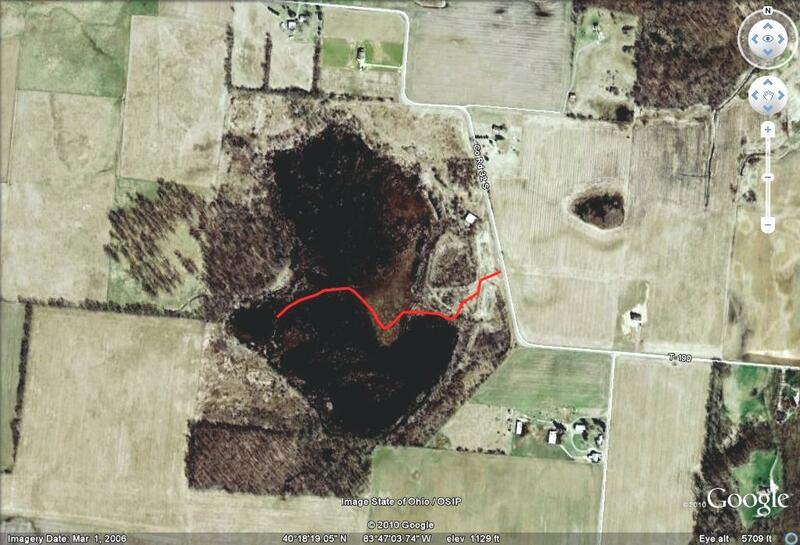 This is in Wayne County, not too far from Wooster, and should be easy to find via Mapquest. 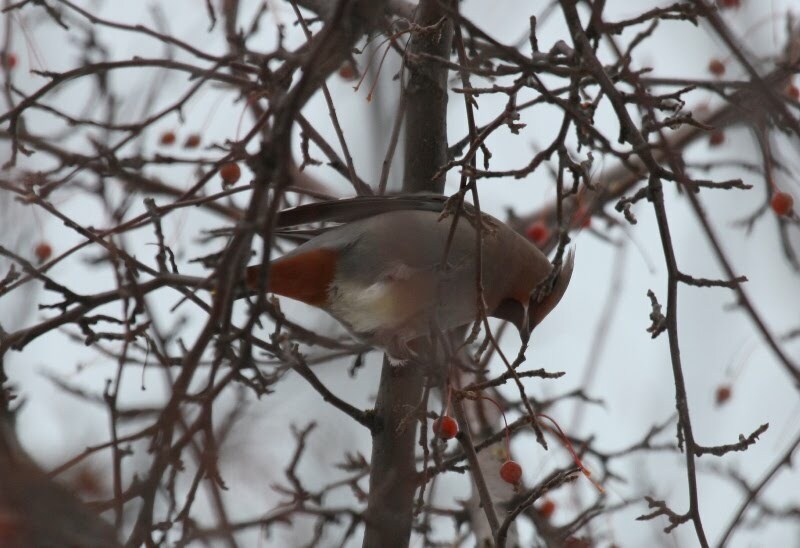 The bird is frequenting feeders along the east side of the house. Dane Adams was up there today, and sent along a few of his characteristically beautiful photos. This is a first-year bird, with just a ring of drippy necklace streaks across its breast. Later, it'll develop a much more extensive black throat and forehead. Harris's Sparrow is one of four species in the genus Zonotrichia, the others being White-throated, White-crowned, and Golden-crowned sparrows. The Harris's is the largest of the lot, even outsizing the chunky White-crowned Sparrow. It breeds in a somewhat narrow belt in the far north, in tundra west of Hudson Bay, and most of them travel due south to winter in the Great Plains. While rare in the east, it is a regular wanderer to our region, and Ohio sees one nearly every year, most of them in the winter. There are at least two cool facts about Harris's Sparrow. One, it is the ONLY bird that breeds exclusively in Canada. And two, it was one of the last North American species to have its nest discovered, due to the remoteness of its breeding grounds. 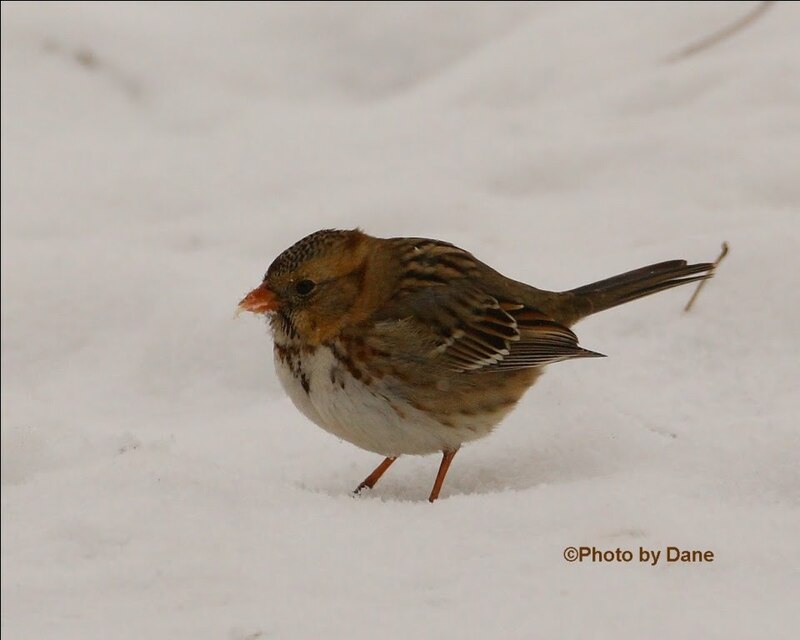 In 1931, legendary George Miksch Sutton found the first Harris's Sparrow nest at Churchill, Manitoba. I was in Churchill - Polar Bear capital of the world! - in 1988, and had the wonderful opportunity to experience these plaintive-voiced songsters on their home turf. Like the other Zonotrichia sparrows, Harris's has a whistled song with a mournful, haunting quality. Harris's Sparrow often fraternizes with White-crowned Sparrows in winter, and frequents brushy fields and scrubby woodland margins. They, as we have seen, are not shy about visiting backyard feeders. Keep your eyes peeled for this one when you are out and about doing Christmas Bird Counts, and at the feeders, especially if you've got numbers of White-crowned or White-throated sparrows visiting. Many thanks to Bruce Glick for getting word out, and to Robert Troyer for graciously agreeing to allow birders to come visit. Bohemian: wanderer, vagabond, or adventurer. 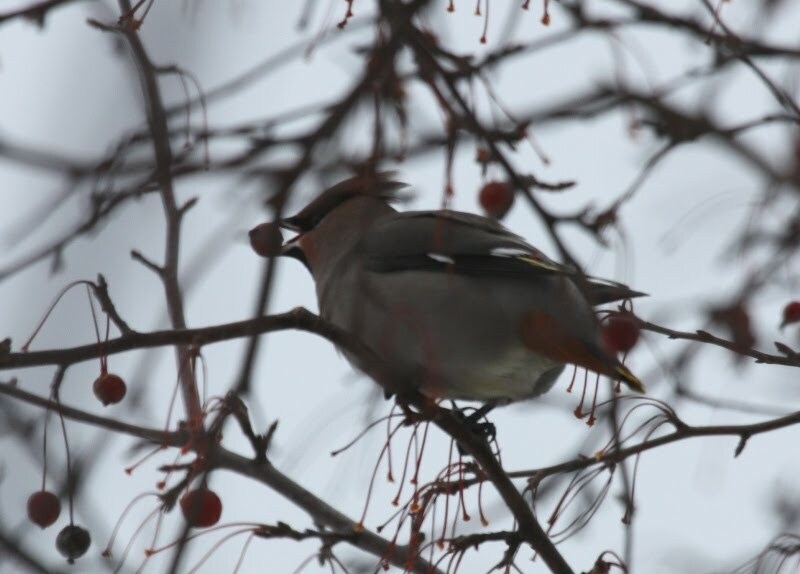 A stunning Bohemian Waxwing, Bombycilla garrulus, plunders fruit from a crabapple on Kelleys Island, Ohio. This is a fantastic discovery in Ohio, and a bird that very few have on their Ohio list. Discovered by the indefatigable Tom Bartlett last Sunday, December 19th as he and Sandy Tkach censused the island for the Lake Erie Islands Christmas Bird Count. Here's the rub, should you be inclined to chase the bird. 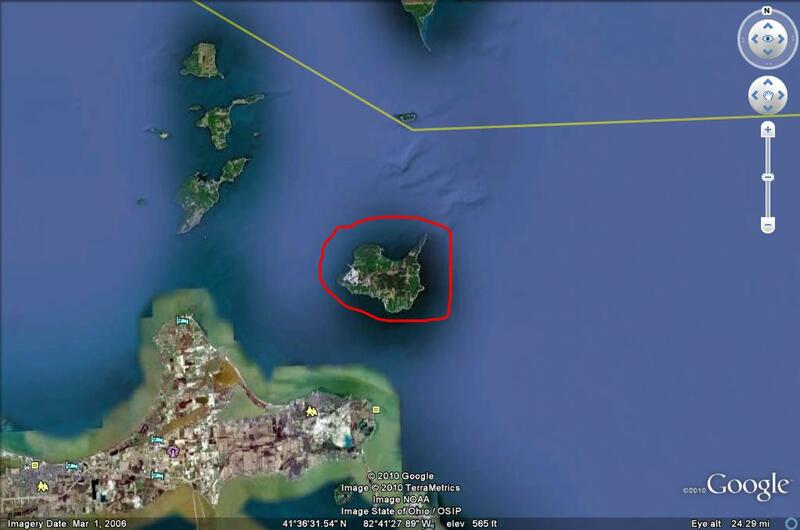 It's way out in Lake Erie, on an island (Kelleys Island circled in red). There are only two practical ways out there: boat, and airplane. More bad news for the waxwing chaser: this is what Lake Erie looks like right now. I took this photo on December 14 a few hundred feet over the lake, in the vicinity of the Lake Erie islands. Since then, the ice has thickened up considerably and the ferry - the only regular public-access boat - has quit running. That means you'll have to hop a flight, and your only option is probably Griffing Flying Service. This Bo-wax is definitely not the easiest of chases! Bohemian Waxwings are even cooler than Cedar Waxwings, and that's saying something. They are bigger and chunkier, with beautiful cinnamon undertail coverts and wings marked up with white. 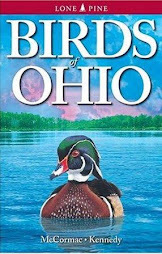 I have seen them numerous times in their breeding haunts in Alaska and the far northwest, and once, in a spurt of greatly fortuitous luck, had a flock of nine on a wintery day at East Harbor State Park in Ottawa County, Ohio many years back. A dweller of boreal forests, Bo-waxes are strongly associated with mountain-ash trees, genus Sorbus, of which fruit they are exceedingly fond. Mountain-ash is also a tree of the north, and only one of those species, the Western Mountain-ash, Sorbus decora, makes it into Ohio. 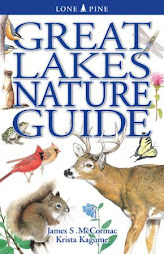 It is listed as endangered here, with a smattering of plants found in Ashtabula and Geauga counties. This waxwing is notoriously nomadic, and it's hard to say whether Tom's bird is still on the island. Waxwings tend to wander far and wide, pilfering fruit from berry trees and then moving on in search of the next crop. In recent decades, we've only had a report of Bohemian Waxwing about once every five years, so this is truly a great find. Congratulations to Tom and Sandy for their discovery. Eastern Phoebe, Sayornis phoebe, Jackson County, Ohio. December 18, 2010, 21 F.
Phoebes are tough as nails, and I've seen them often in wintertime Ohio. But I was a bit surprised to find one last Saturday on the Beaver Christmas Bird Count. Extended freezing temperatures had created an icy winter wonderland, and the evenings have been downright frigid. But there it was - a hardy little flycatcher, hanging out near the only open water that we saw. Even in the midst of wintery weather, some insects will remain active in such haunts, and phoebes will attempt to make it on what has to be meager pickings. Need be, they'll dine on fruits such as sumac to get by. Ah! A familiar silhouette greeted us yesterday, from the topmost boughs of a massive sycamore deep within Green Lawn Cemetery. The Merlin has returned! While participating in yesterday's Columbus Christmas Bird Count, Bernie Master and I navigated the labyrinth of roads within the massive 360-acre cemetery, tallying all that we could find. Foremost on our wish list was the Merlin, which has now returned for at least its 4th winter. One can never take these bulletlike speedsters for granted. A Merlin can cover some serious ground, and their hunting turf is expansive. Nonetheless, as we neared the sycamore in the photo, our hopes rose, as if the bird is in residence, it's likely to be ensconced at the summit. This lofty perch provides a commanding vista of its domain, and a good lookout from which to watch for lesser birds and potential meals. It was a frigid morning, and our Merlin was fluffed against the cold, exaggerating its bodybuilderish dimensions. Even when we were nearly under its tree, the falcon would scarcely deign to cast a glance down. These fierce predators seem haughty and arrogant, and us clumsy and sluggish bipeds don't merit its attention. We are neither prey nor threat and not worth even a sideways glance. A brand spanking new birder, Lisa, was in our party and this Merlin was a lifer for her. In fact, I believe this bird - which I think is the same individual as in past years - has been many a birder's inaugural Merlin. I was hoping that a hapless cardinal or junco would bumble by, and the Merlin would scramble for a kill. Watching one in action is quite a thrill. No such luck this day; the bird sat fat and content, probably digesting its breakfast I suspect. If you find yourself at Green Lawn Cemetery, watch the treetops closely. And definitely check out this sycamore tree, which is a short distance due south of the bridge, which is towards the southwest corner of the cemetery. A map, which depicts the bridge, is HERE. Later in the day, we stumbled into another species of falcon, an American Kestrel. This one is a female, and is typical of their habits, it was perched on a roadside wire. While Kestrels superficially resemble Merlins, their overall gestalt is quite different. Merlins are much more powerful, purposeful looking falcons. Even if you can't see details of plumage, the Kestrels impart a, for lack of a better word, flimsier appearance. Their flight is light, bouyant and butterflylike, while that of the Merlin is swift and direct, as if the bird had a destination in mind. Also, I don't believe I have ever seen a Merlin perched on a wire; Kestrels are pathological wire-sitters. We were almost more excited to see the American Kestrel. 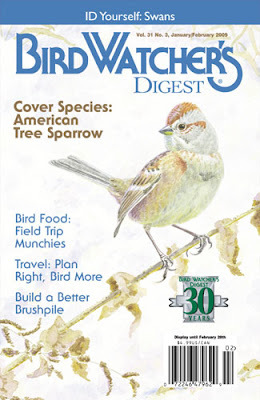 Their decline has been dramatic, and nearly every longtime birder I know laments their loss. On excursions where, back in the day, I might have toted up a dozen of the little falcons, I'm now lucky to count one. The Columbus CBC serves as a microcosm of the larger-scale picture of Kestrel declines. An average of only 6 birds were tallied each year on the count over the past decade. The previous decade saw an average of 21 birds counted yearly. And the decade before that, the yearly Columbus CBC total averaged 41 birds. The reasons behind the decline of American Kestrels are somewhat complex but mostly common sense, and I'll have a look at these factors in a future post. American Tree Sparrow, Spizella arborea, Marion County, Ohio. I've been spending a lot of time out in the field, mostly because it is Christmas Bird Count season. Did the Beaver CBC yesterday, and the Columbus count today, with two or three yet to come. During a trip to Big Island Wildlife Area last weekend, I ran into a cooperative little pack of one of the most interesting birds to grace our wintertime landscape, the American Tree Sparrow. These tough little birds have come a long way; they nest in the tundra of the North Country, and the bird in my photo above may well have traveled 1,200 miles or more to be with us. I wrote a cover story for Bird Watcher's Digest on tree sparrows for their winter 2009 edition, and it was a fun piece to write. The article was complimented by wonderful artwork by David Plank. There are few birds that I admire more than American Tree Sparrows. For one, they are fun to watch. The flocks greatly enliven somber fields of goldenrods, their tinkling calls sounding like the shattering of distant icicles. These rusty-capped seed-eaters love the fruit of goldenrod, and dangle like feathered acrobats as they pull and pluck the seed heads. 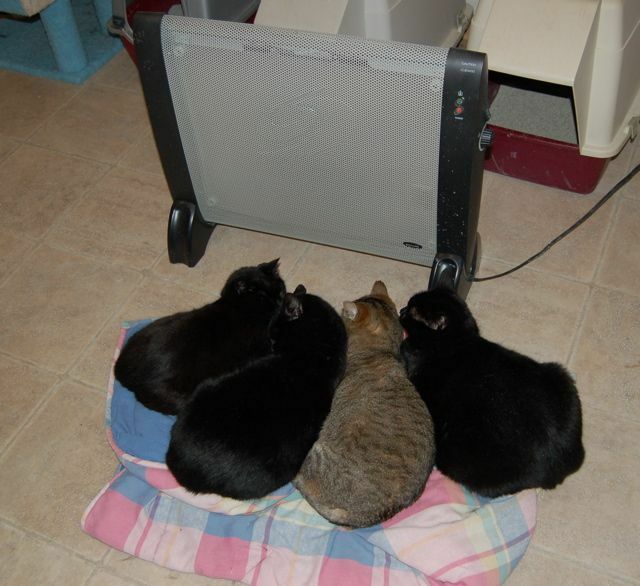 But what impresses me the most about them as their ability to deal with COLD weather. Many is the time that I've watched flocks cavorting about fields, busily gorging on the seeds of various old field "weeds" on days so cold it hurts to breath. Watching them, I always think about their upcoming night. Clear starry winter evenings, when the temperatures plummet to 0 F or colder, and you've got no warm bungalow to repair to, makes for a long evening. That's why tree sparrows really stoke the furnace with all of those seeds. An efficient forager can shovel in 6 grams of food a day - nearly one-third their weight! They need all of that energy to make it through the long winter nights. I found myself at Big Island Wildlife Area yesterday, and stayed until late afternoon, when the Short-eared Owls emerged. The number of owls using this nearly 6,000 acre wildlife area has grown steadily since I last reported on them. We saw about ten of them at once last evening, and many others were present elsewhere. There might be as many as 40 or 50, all told. There's a reason that so many rather antisocial owls are packed so densely, and the answer dwells within this tunnel. If you find yourself at Big Island on an owl-seeking mission, take a moment to scan the snow-encrusted ground for holes such as this. Then look within, and if the occupants have been active of late, you'll likely see fresh grass cuttings and tiny feces that are shaped like Tic-Tacs. The owl's favored fresh meat - Meadow Voles, Microtus pensylvanicus, the maker of the holes in the snow. Snowfall serves these chunky mouselike rodents well. It insulates their runways, and probably increases the temperature within their grassy domain. 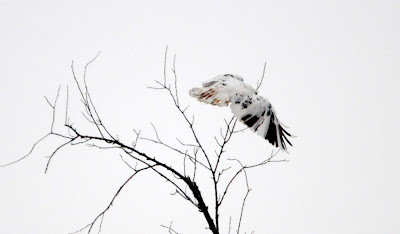 Perhaps better yet, the snow offers camouflage from the numerous aerial predators that like to snack on them. Cute as a button, and to an owl, a furry bratwurst with legs. In spite having snow-covered shelter in the form of a labyrinth of tunnels, the voles just can't seem to resist flirting with danger. They'll poke from their holes, apparently for a look-see around the landscape, or make mad dashes across open ground. Such boldness can be a fatal mistake. Like feathered predator drones, the platoon of owls thoroughly sweeps the fields, and those ultra-sharp eyes and ears don't miss a trick. Even a vole's quick run from cover is enough to send a Short-eared Owl barreling down and bushwhacking the little rodent before it knew what hit it. I have to chuckle at the nattering nabobs of negativity who love to chatter about wetland/wildlife restoration projects funded by sportsmen's dollars. They perpetually claim that such work only goes to benefit ducks, as that's all that hunters care about, and the agencies that oversee such projects only aim to create "duck habitat" and could care less about nonhuntable critters. A short decade ago, the land now frequented by these owls was in rotations of soybeans, corn, and wheat, and had been for decades. Miles of drainage tile siphoned away the water that moistened this fomer wet prairie, drying the soil enough that crops could be grown. Now, because of the Division of Wildlife's restoration work - funded by sportsmen's dollars - a much more diverse ecological system of prairie plants thrives. Wilson's Phalaropes have bred here, as have many other nongame wetland-dependent birds. The spike in plant diversity jumpstarted the food chain, allowing important prey species such as meadow voles to flourish. And thus the owls have come, to delight the scores of (mostly) non-hunting birders that come to admire them. If you don't pay for habitat conservation via a hunting license, consider purchasing a Migratory Conservation and Bird Hunting Stamp ("Duck Stamp") or the beautiful new Ohio Wildlife Legacy Stamp. Short-eared Owls are quite distinctive, even from afar. They row through the air with deep floppy wingbeats, jagging erratically over the hunting fields. If a vole reveals itself, the owl might briefly hover before plunging down and attempting to seize it. Short-ears rank high among the most interesting birds to watch. They really don't seem to care for company, but when so many owls are hunting the same area, as is the case at Big Island, conflicts abound. These two crossed paths, and began barking at one another and dropping their talons in a threat display. A bit of strafing, barking, and showings of the claws, and they went their separate ways. I hope you can make it up to Big Island to see the show. The owl circus seems to have shifted to fields along Espyville Rd. (T-84) between State Route 95 and La Rue-Prospect Rd. The wildlife viewing deck off 95 can also be good, and owls are being seen over the large impoundments on the north side of LaRue-Prospect west of Espyville Rd. A scan of the map in THIS LINK will reveal all of these sites, and if you make the trip soon I'll guarantee you'll see owls. Just remember, these flat-faced hooters are most active late in the afternoon, towards dusk, and that's when you should visit. McCracken Fen State Nature Preserve, Logan County, Ohio. This is a very interesting place, but you don't want to visit alone. It's probably the most potentially hazardous place that I've explored, and besides, one MUST get a permit to visit, and hopefully the permit issuers will note that the permitee must have company. This blog has been sitting on the shelf for a few months. I often save photos from this trip or that, but other things come along and preempt their posting. Well, after spending a good chunk of today essentially outdoors, with temps never warming much past 20 F, it's time to go back to summer, at least virtually. Back on August 30, I met up with fellow botanists Dan Boone, Jim Decker, Tom Arbour, and Brian Riley and set out in search of some rare plants. McCracken Fen certainly has them. Guy Denny showed this place to me nearly 20 years ago, and at that time, no one had been in it for a while as the fen was so thoroughly overgrown with thicket-forming shrubs. It was essentially impenetrable, they said. But in the years since Guy had last visited, a mining company had purchased the fen and done their best to strip it of its peat. Apparently the business went bankrupt before they could scoop all of the peat away, and the end result was as if a giant had tossed the whole wetland in an enormous milkshake mixer and stirred everything up. Succession was set way back, and plants popped from the seedbank that probably hadn't seen the light of day in decades. Plus, one could once again walk through the place with some ease. The rarest species that we found was a tiny sedge called Smith's Bulrush, Schoenoplectus smithii, which at the time was not known to exist anywhere in the state. Stimulated by the disturbances of draglines that had inadvertently created large peaty mudflats, the bulrush had come up by the thousands. And Smith's Bulrush was priority one on this expedition. The problem? Getting to the site. The above map's red line approximates the route that we had to take to get back to the place where we had last seen the bulrush, some five years before. There is an old saying in field botany (at least I say it): "To find the rarest plants, take the path of greatest resistance". Here, Jim Decker (L) and Dan Boone wade through a nearly impenetrable thicket of dogwood and, worse yet, Swamp Rose with its abundant flesh-lacerating thorns. Pushing through this stuff is hard enough, and we all emerged scarred and bloody, but you've really got to watch your footing. It's all quite soft and boggy, and one misstep can send you in to your waist, or deeper. This is the site we had to reach, and the view once one bursts from the thicket. That soft green mat on the foreground is quaking treachery; a thin sheet of muck over open water. And where, a mere decade prior, scads of Smith's Bulrush grew. We could find none. It's had its day in the sun, and even the light pressure of competition of other small sedges has displaced it from an above-ground niche. The bulrush is still there, just in seed form and under the ground. 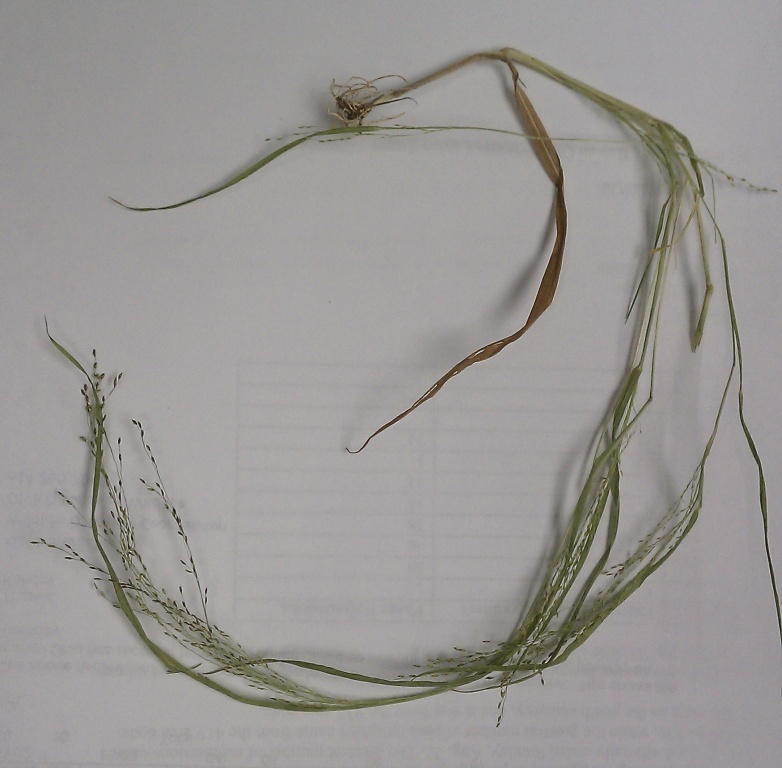 Plants such as this bulrush have a "boom and bust" ecology. When conditions become suitable for them, they spring to life and produce scores of tiny bone-hard seeds called achenes. This population of Smith's Bulrush, over the decade or so of boom times that it had most recently at this site, probably produced hundreds of thousands of seeds if not more. They may lay dormant for another century, but when some traumatic disturbance once again rips them free from the ground, the plant will once again run rampant. This is an intrepid and knowledgeable bunch (L to R): Dan Boone, Tom Arbour, Brian Riley, Jim Decker. It's always cool to be out with a cast of characters in which at least someone will know EVERY plant encountered, no matter its condition or stage of growth. But, we nearly missed a cool one right in the spot above, and its discovery somewhat atoned for the disappearance of the Smith's Bulrush. Looking down at my feet, I noticed a spindly little grass and realized it was Philadelphia Panic Grass, Panicum philadelphicum, a species that is quite rare in Ohio and one I had only seen once before. Here's a specimen - a plant only a botanist would get excited over. Thin and wispy, it exudes a certain charm, and under close inspection has purplish-black, or nigrescent, fruit. The taxonomy with these things is somewhat unsettled, and there are those that would carve this one out as Panicum tuckermanii, and maybe that's for the best. Even that variety/species is rare in Ohio, though. So while we may have come up short on the bulrush, we once again proved that thou who takes the path of greatest resistance will be rewarded. 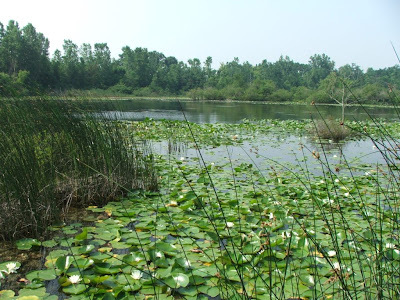 FOOTNOTE: Tom Arbour rediscovered Smith's Bulrush along Lake Erie this year, in the vicinity of a site where Dr. Ronald Stuckey had found it several decades ago. See Tom's post about this find HERE.